Exeter City manager Paul Tisdale says he is frustrated for Will Hoskins after the striker had a back spasm before their 1-1 draw with Newport. The injury happened while the Devon side were warming-up, less than half an hour before kick-off. "I heard at 25 to three he'd fallen and had a back spasm, so that's very disappointing for him," Tisdale said. "We had to scurry around to make our changes. We'll see how he is, I don't know how bad it is at the moment." 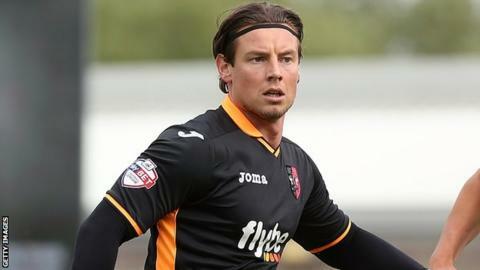 Hoskins, who joined the club this summer, was replaced in the Exeter line-up by former Republic of Ireland international Clinton Morrison. Meanwhile, Tisdale praised the form of wingers Lee Holmes and Joel Grant, the latter scoring City's goal on Saturday. "I think he (Grant) looked a threat and had a skip in his play," added Tisdale to BBC Radio Devon. "He had a bit of energy about him. "I'm not surprised he was the one who got the goal because he and Lee Holmes both had a bit of poke about them."